A popular South Indian cuisine Siribaraji. Using good quality fresh spices and fresh material, we will deliver the authentic taste of South India as it is. 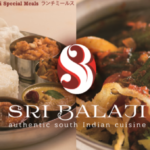 Please enjoy the real flavor of Southern India at Sibara Razi! Lunch set is recommended for lunchtime on weekdays. Saturdays and Sundays offer special lunches different from weekdays.Course menu of 4500 yen can be reserved.